The one who started it all, what seems like a thousand years ago. One horse can change your life, leave hoofprints on your heart and live daily in your thoughts for all the rest of your life. I met Ben when I was 8. He was the first horse I ever rode. He became my first horse and he became the best friend I ever had. I lost Ben to an allergic reaction to a vaccine when I was 14. I would like to say I recovered, but that would be untrue. I can safely say there never has been a horse greater than he, though. And that is the truth. This rescue is for you. May it grow as fast as an Amaryllis and blossom as boldly so you see from Heaven that I remain crushed without you. It is with great sadness we announce the passing of this mighty Percheron. The day came that he could no longer raise his great body. It happened on a sunny, warm day. I fed him his breakfast as he lay in the field. Comanche and Abraham were with us. The vet arrived and Ben never again tried to rise. I told him everything he was never told. I told him how awesome a horse he was, how he enabled an Amish family to survive, how he was needed and respected and how much he was deeply loved. He understood and listened intently. I told him of where he was going and how the rainbow bridge was where he would regain all his lost strength and vigor. He would gallop free again and his mighty heart would be happy. I told him that God would meet him as he entered Heaven and the words he would hear would be "Well done, my faithful servant" and God would (((HUG))) him. The love I have for animals comes from my mother. You can safely say this woman who raised 7 children and held a marriage together for 40 yrs; who buried 3 sons and her husband; who worked to promote Amaryllis and help raise feed money for the horses even without fail throughout her last 2 yrs of battling cancer was a saint. Alas, she was not. She was just a woman predestined to single handedly alter the future for the horses and she succeeded. Amaryllis' successes are hers. Tens of thousands of people were educated along the journey. Hundreds of horses told they were extraordinary. Numerous farm animals hollered at the sound of her approaching Jeep. Honor, integrity and an unfathomable strength carried my mom throughout her life. Dozens of beloved horses waiting at the Rainbow Bridge have carried her into Heaven. Once inside the Pearly Gates, the horses circled around her and asked the plan. Behold, the horse nation on earth now has the most powerful ally in Heaven. you left the rescue and all it's inhabitants devastated. Aramis, I told you a thousand times...you were too good for this world we live in. Apparently God thought so too. A mighty pony trotted into Heaven. A brave little man from the time he was born. A trustworthy partner for near three decades. A mentor to young rescued horses. 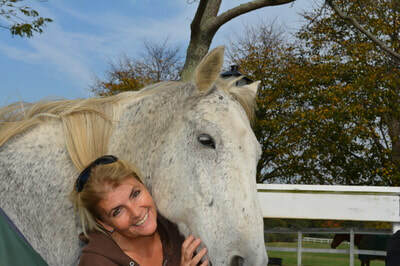 A confidant for troubled rescued horses. A jovial friend for any horse needing an emotional lift. A solid citizen for hundreds of children experiencing their first ride on a pony. A big brother to Rachel. Run in peace Little Boy Iroc. Give Clarke a howdy for me. Abraham was slaughter bound after spending a year chained to a fence in his backyard, fed by his deceased owner's fearful sister. 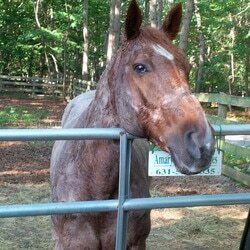 Abraham is a Bashkir Curly or Appaloosa cross gelding pushing 30yrs old now. He arrived with a halter so imbedded in his face, it had to be carefully cut out. You can clearly see the mark he will bear forever. Abraham, we believe was someone's pet. His front legs are very splayed and he would not have been rideable from youth. Perhaps she saved him as a youngster but she aged herself too soon. We will never know. Abraham is tough, resilient and gentle. He is typical of backyard horses whose owners never consider the future for them. Please support your local, legit rescues and try to secure a permanent placement for your horse in the event of your demise. Without support and funding and on mortgaged land, your horse will not be safe. Your horse has always and will always depend on you. Abraham has journeyed on. He spent almost a decade with us. He ate his warm, mashed senior grain dinner and later on went to his comfy sleeping spot and went to sleep. He awoke in Heaven. The angels are hugging him now. His old horse buddies are welcoming him. 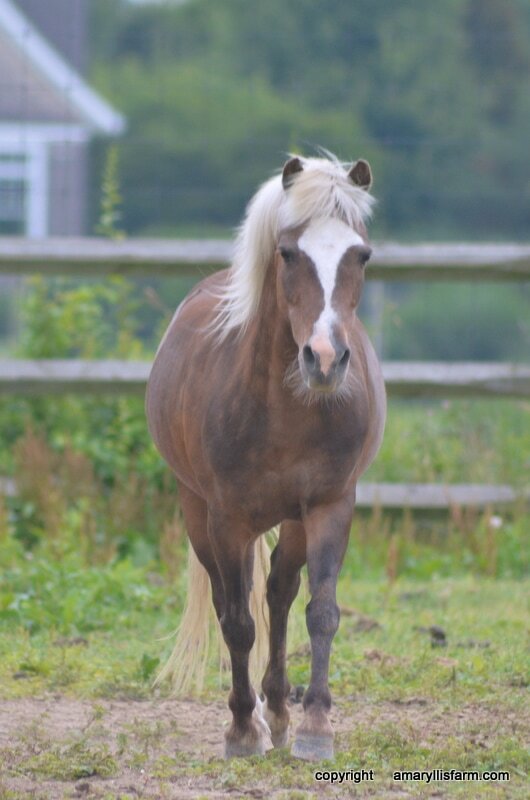 Sargent was saved in 2007 and lived with us for a decade before crossing the rainbow bridge at well over 30yrs old. He was enormous and was a work horse for the Amish for most of his life. He had several battle wounds on him but the big issue he deals with is a recurring abscess in his front hoof. When we saved him off a slaughter lot in Pennsylvania where he was actually waiting for the Tanners to pick him and a few others and 3 mules up to be skinned. I never really thought about mules skin and pony hide and cordovan leather before. Guess where it comes from? He had a hoof that looked like a cannon ball was shot through the front of it. I am guessing this is why he was discarded after his season working for the overweight people camp. Then again, most seasonal camps discard through auction before fall. His ankles were enormous, arthritic filled joints and his eyelid did not meet top to bottom because an injury apparently never received veterinary care, so his eye would run day and night. He was covered in burdock. It took many days to work them out with mineral oil. He was about 200-250lbs underweight. He was scared. It has been our experience that the bigger horses are treated more roughly. Sargent, though bore no malice about his past. He went on to become a sweet and kind, gentle soul ever thankful for a treat or a pat on the neck. Baby carrots were the greatest food on the planet in his voiced opinion! He enjoyed his pampering and blankets for comfort. We joke sometimes that our horses may have more clothes than Madonna....but to us, each of them is a celebrity in their own right. Comfort, peace, dignity and exceptional nutrition, care and understanding may not win over Father Time in the end, but our efforts give Mother Nature a run for her money and our horses know only comfort while they walk this earth. After all, most have suffered at the hands of cruel or ignorant owners prior to arrival here and are no longer youngsters. Sargent will be heard as thunder as he gallops freely across the boundless pastoral Heavens. His sweet face, the way he would tilt it a little to the side and softly nicker for carrots.....this is embedded in my head. So abused, so grateful....and now so very missed. 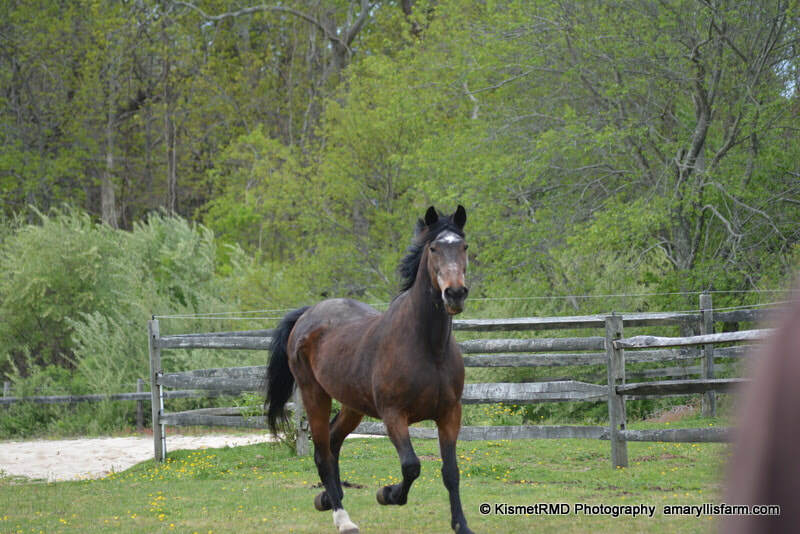 Rex came in over 5 years ago as a teenaged, very unsound warmblood who was a show horse down south. He suffered from navicular in both front, EPM, horrifying thrush in all four hooves, canker and arthritic issues. He could not turn sideways properly and he had absolutely no ability to use his tail. When he first arrived, he could not even be turned out with other horses because his neurological issues caused him to fall. 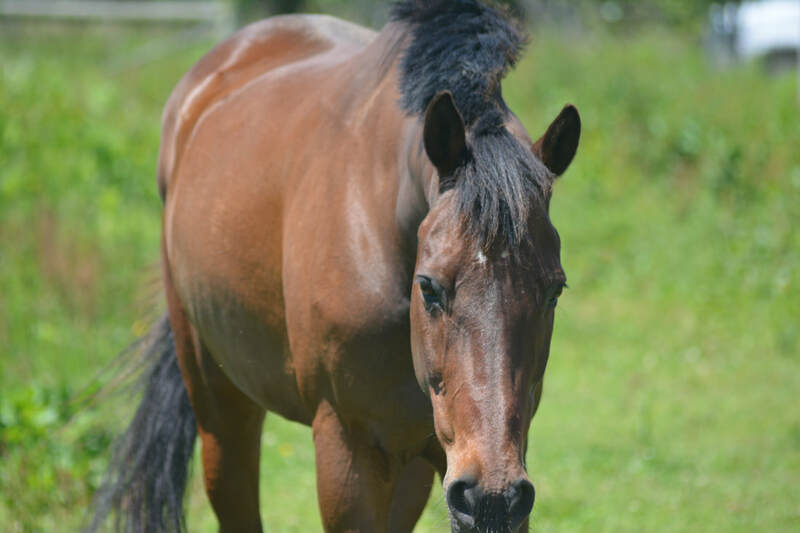 A year with a personal 24/7 turnout and stall with a small hill built his non-existent hind end muscle and gradually allowed him to loosen and use muscles that are very tight and stiff in horses forced to stand in stalls. Years later, he moved as freely as possible around his 8 acre paddocks and had a full time partner, Frisco who is a particularly playful horse. Flysheets in summer because his tail was useless to him and blankets of varying insulation in inclement weather as the EPM made him more sensitive, were necessary for his comfort. Special boots of differing brands (Soft Ride and Easy Boots) gave comfort and allowed him to play. Farrier care every 21-28 days became needed in the last couple years. Rex and Frisco enjoyed each other's company immensely and were essential to each other's health and happiness as they aged together. Two other sanctuary residents completed their mini herd and life was fun for all. Special medical care, farrier care and supplemental assistance could not eventually stop the pain for this special soul. He was surrounded by horses and humans who adored him as he gently crossed the Rainbow Bridge. All will continue to be devastated by his loss. Rex was not your average horse. Sky. One of my very favorite Thoroughbreds ever. Sky had more life in his ear than many have in their entire bodies. He never tired, he never conceded defeat. Ever. By the time I met him, he had been raced (Bright Ensign) and evented for many years, passed through several owners, starved at least once, escaped euthanasia twice, foundered and discarded at a crashing rescue. Destroyed hooves and ulcers, a knee that abscessed and began a battle with proud flesh due to not only it's location, but his inability to heal himself. He had a hip injury that caused him to alleviate weight on one leg, which in turn put more on his opposing leg. That leg battled lymphangitis regularly. Just a mess all the way around. Sky took radical and constant care and yet he seemed to smile the entire time. Sky fought every single ailment that beset him for the four years he lived with us. He never tired of any game and he bested the most impressive horses. Sky was only 21. What injuries and stress people heaped on him he bore gallantly. Look at the extreme horse sports for what they are....cruelty. Overtaxing a living being for the 'sport' of is ridiculous. We have seen and cared for beat up, crippled thrown away show jumpers, polo horses, racers and all manner of work horses. How is it that in this day and age so many equine events offer "open bars"? "Shopping"? Really? If so little attention is actually being paid to the horses, of course their care and consideration is going to be lacking. The injuries the horses must live with (if they are allowed to live) can be barbaric. People get away with it because the horses cannot speak. I will climb off my soapbox now but I really cannot express what these horses go through, especially as they age. It is not fair. Or necessary. Sky was the bravest horse I ever met. This horse left a devastating hole in the hearts of all who loved him....but especially me. He is one horse I would be honored to have a ride on when I meet him in Heaven.